This example project uses the Timer Driver Library (Dynamic implementation) to execute timer interrupts. The period of these interrupts and the number of interrupts to count for a given alarm period are calculated for you. Every 500 ms, a callback function will be executed to toggle LED 3. Create the timer alarm initialization function. Calculates the timer period used to generate interrupts. Calculates the number of timer interrupts needed for a specific alarm period. Open a Timer Driver, register a callback function with it, then start the Timer Driver. Create the callback function to change the state of the I/O Port pin connected to LED 3 at the end of an alarm period. 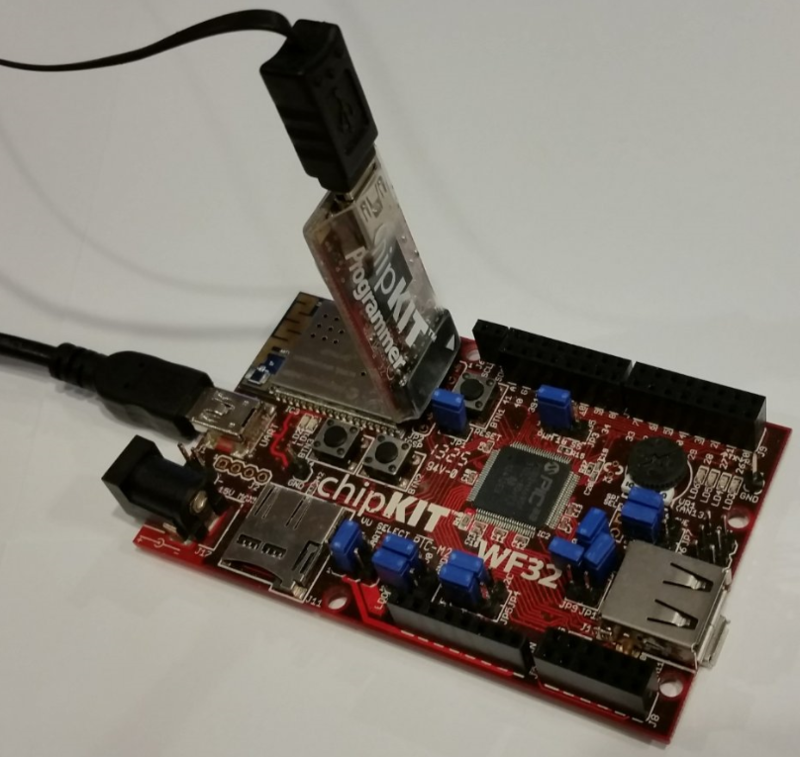 The hardware for this project uses the chipKIT™ WF32 board from Digilent Inc. 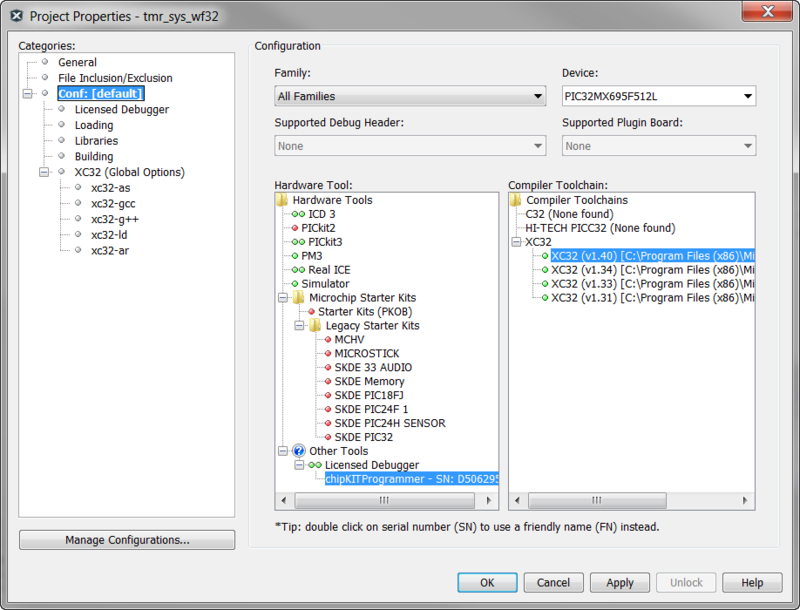 This image shows the chipKITTM PGM programmer/debugger from Digilent®. Microchip programmer/debuggers (e.g. PICkitTM 3) can also be used. The contents of the following zip file need to be placed in this directory. If this is not done, the MPLAB® X IDE will not be able to find all source files, and the project will not build successfully. The Target Device used on the chipKIT™ WF32 is the PIC32MX695F512L. Verify the the System PLL output is configured for 80 MHz. 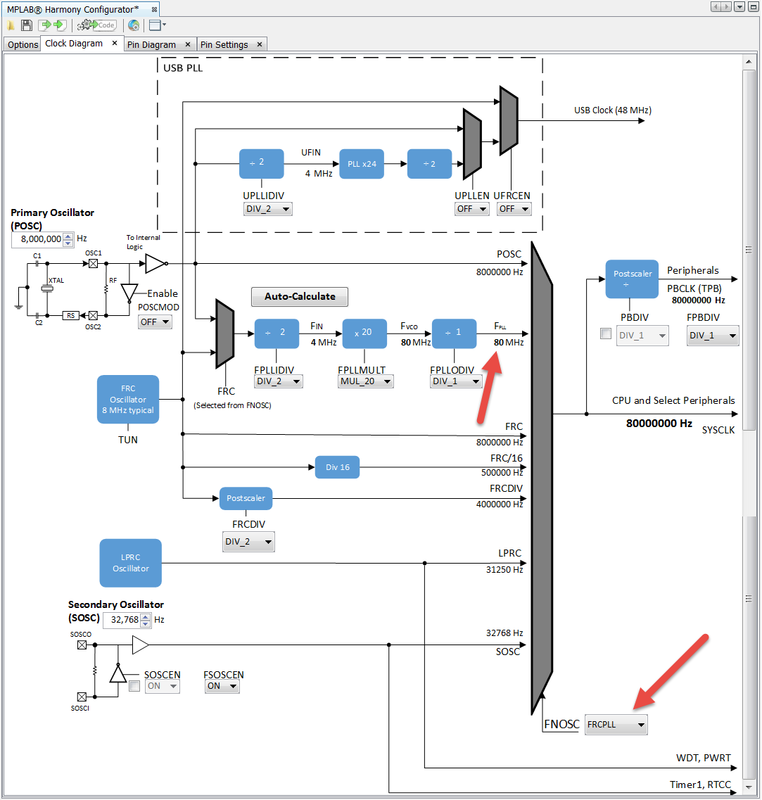 Verify the oscillator selection (FNOSC) is configured to use the the PIC32's Fast RC oscillator with the PLL (FRCPLL). 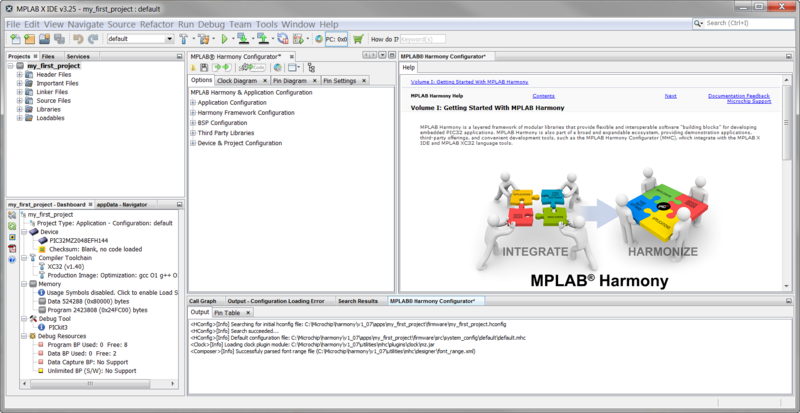 Click on the Options tab in the MPLAB® Harmony Configurator window. Check the box beside "Use Timer Driver?" You will use the default values. No other changes are needed. The default values create a single Timer Driver instance (TMR Driver Instance 0). This instance has been configured to use the PIC32 Timer peripheral named Timer1 (Timer Module ID: TMR_ID_1). The "0" in "TMR Driver Instance 0" refers to the software driver instance, not the number associated with the PIC32 Timer peripheral (e.g. Timer1). The timer driver instance defines parameters relating to a specific timer hardware peripheral. It defines which PIC32 Timer peripheral will be used for the driver instance (TMR_ID_1 = Timer1, TMR_ID_2 = Timer2, etc…), and defines the hardware configuration for that peripheral. Note how the MHC configuration tree is highlighted to show a change from MHC's default value. You can use this feature to easily find all the changes you've made in MHC. One PIC32 I/O Port pin will be used to blink LED 3 on the board. The LED will blink with a 1/2 second period. 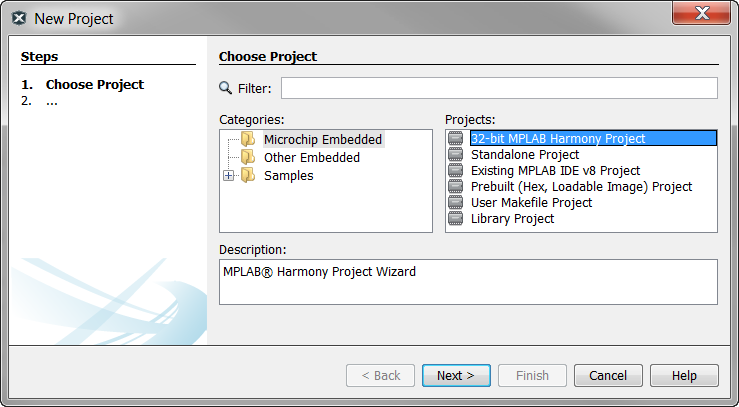 Click on the Pin Settings tab in the MPLAB® Harmony Configurator** window. Scroll down the list to find the pin listed in the table below. This I/O Port pin is connected to LED 3. Open the app.h file, and add the following application variables to the APP_DATA structure (near line #111). The value in the tmrPeriod register is compared against the value in the Timer1 counter register. When tmrPeriod equals the Timer1 count, a Timer1 interrupt will be generated. alarmCount is used to count each Timer1 interrupt. When alarmCountMax equals alarmcount, the end of the alarm period has been reached. alarmCount will be reset to 0, and will continue to increment with each new Timer1 interrupt. Add application-specific configuration constants to the project in system_config.h. Open the system_config.h file, and add the following application-specific configuration constants (near line #134). The APP_ALARM_PERIOD macro specifies how long the timer alarm period is (in terms of ms). Don't confuse the timer alarm period with the Timer1 interrupt period. For shorter alarm periods that can be implemented with a 16-bit counter (one interrupt generated), these periods will be the same. Longer alarm periods will require you to keep track of how many interrupts have occurred. APP_ALARM_PERIOD is used, along with the Timer1 increment rate, to determine the total number of Timer1 ticks that are needed for the alarm period. Open the app.c file and add the following code (near line # 89). Create the callback function that will be executed by the timer interrupt service routine (ISR). Note this isn't the actual Timer1 ISR. The Timer1 ISR will call the DRV_TMR_Tasks() function. this will process the Timer Driver events. These events include checking to see if a timer interrupt has occurred. If this is true, it will execute the callback function you registered with the driver (you will register the callback function with the driver in a following step). In the app.c file (near line #109), add the following function to calculate the Timer1 period and the number of Timer1 interrupts to count to implement the full-timer alarm period. countsPerAlarmPeriod Holds the total number of Tiimer1 ticks needed to implement the whole alarm period. If the number of ticks per alarm period is less than 65536 (maximum value for the 16-bit counter), then the number of Timer1 ticks per interrupt period will equal the number of Timer1 ticks per alarm period. timerPeriod The value loaded into the Timer1 period register. This value is compared against the value in the Timer1 count register. When they are equal, the Timer1 ISR will start. countMax Holds the number of interrupts that are needed to implement the whole timer alarm period. When the timer alarm count equals countMax, the end of the timer alarm period has been reached. In the app.c file, add the following code to initialize the Timer Driver handle and Timer1 interrupt (alarm) counter (near line #143). Open the Timer Driver, register a timer alarm, and start the timer. In the app.c file and add the following code to the APP_Tasks() function (near line #165). Opening the Timer Driver creates a client for the Timer Driver (your application is the client). The DRV_TMR_Open() function returns a handle (pointer) to the Timer Driver client object (a structure with members defining the client). Now that you have this handle, you can register an alarm with the Timer Driver. Registering an alarm allows you to set the timer period (interrupt period), and allows you to specify the function that will be run when an interrupt occurs (the callback function). The "true" function parameter specifies you want the alarm to be periodic (as opposed to one-shot). The "0" function parameter is a user-defined variable that can be used (or not used as in this case) to pass a parameter into the function. Don't forget to start the Timer Driver using the DRV_TMR_Start() function. Connect your chipKIT™ WF32 and chipKIT™ PGM programmer/debugger (or PICkit 3, ICD 3 programmer/debugger) to your computer. The programmer/debugger shown in this image is the chipKITTM PGM from Digilent®. Open the Project Properties window. "Other Tools > Licensed Debugger > chipKITProgrammer"
XC32 (v1.40) If a newer compiler version is available, try using that version first. After successfully building your project and programming your development board, you will see LED 3 blink (on/off) once a second (on 500 ms, off 500 ms). Change the APP_ALARM_PERIOD macro you created in system_config.h (near line #144) to modify the LED blink rate. You have successfully used the MPLAB Harmony Timer Driver Library to create a periodic delay. You can experiment by changing this to a single (one-shot) delay, or by creating another Timer Driver to blink a different LED.